Brielle is crippled by her despair as she blames herself for her best friend’s death. To learn to cope, she returns to her dad and the small town she calls home from the big city where she had attended a performing arts high school. Old friends reach out to her, but she rebuffs them. Then an amazing new boy shows up and shakes her from her lethargy. Jake shares a supernatural gift with her, and soon she’s aware of angels and demons. In fact, she can see what no one else can. And she learns that a demon wants to kidnap Jake, who’s becoming dearer and dearer to her. What can she do to protect him? After all, she’s just a girl with angel eyes. I thought this book was terrific. The angels and demons fit the Biblical mold. Not only were there unforgettable characters and unpredictable situations, but Dittemore crafts words like a poet, with beauty and strength. You should read this book! I’ll be waiting for the next one in the trilogy, due out in a year or so. 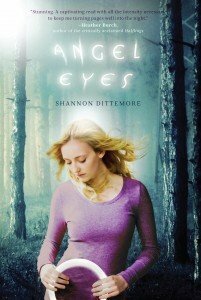 This entry was posted in Reviews and tagged angel eyes, angels, biblical, book review, christian book, demons, dittemore, Thomas Nelson, young adult on June 13, 2012 by Editor. Phyllis! Thank you so much for your kind words. I’m so grateful that you took the time to read and review Angel Eyes and my heart is all jumpy cause you enjoyed it. God bless, friend. Write some more! I can’t wait!